Girls, Halloween is exactly two weeks away and it is time to start thinking about that outfit. Whether you are a saint or sinner, we have a huge variety of stunning evening dresses that will complete your look. 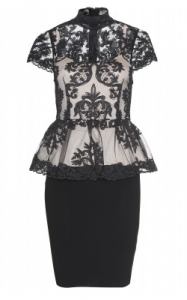 At Girl Meets Dress we just love lace, in fact we can’t get enough of it. It is the perfect material for a look that is dark, seductive and elegant. There is nothing out there that beats a fabulous black lace evening dress. Luckily for you, we have over 4000 dresses from over 1500 designers, including a huge variety of black lace evening dresses that you can rent for the night. If you want a floor-length, mid-length or mini – we have a stunning collection of black lace evening dresses that would make both Wednesday and Morticia green with envy. Since Halloween is just around the corner we have selected our absolute favourite black lace evening dresses that are appropriate for any event, whether your partying the night away or trick-or-treating. It simple – order up to three black lace evening dresses and you will get fully refunded for anything returned and unworn! You can even come to our lovely Battersea showroom, just book your appointment HERE, oh and you get a free beauty goody bag. Posted October 17th, 2014 in Uncategorized.